Mini 4.5g square chocolate bars in MILK, MINT CRISP, PLAIN, MINT or ORANGE flavour. PRICE DECREASE FOR ORDERS OVER 50 BARS (bulk purchase discount). To receive this discount please e-mail your order to info@itsawrapcornwall.co.uk where we can process your order manually. Alternatively please place your order online and we will refund the discount. 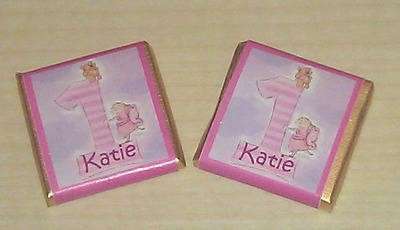 Other personalised products with this "1st birthday pink" design also available.